John White's latest book, Irish Devils - The Official Story of Manchester United and the Irish, is a beautifully crafted story board of the profound and intimate involvement of the Irish with the most famous football club in the World. Irish Devils is a greatly expanded version of the Manchester United Irishmen section on this site and it provides some fantastic facts and details about how Irishmen from the whole island of Ireland influenced the history of United. This extensive telling of the Manchester United / Ireland connection begins with "...the first official record of any link between the club and Ireland." - a match between Belfast Distillery and Newton Heath (as United was known then) in 1889 right through to current players Jonny Evans and Darron Gibson. John White's exhaustive research has produced a unique exposition of the extensive relationship between the Irish and the Manchester United Football Club. His masterful exposition is so loaded with nuggets of information and facts that even the most ardent Irish United fan is bound to discover many unknown gems. White carefully weaves the arrival of Irish footballers, starting with Thomas O'Shaughnessy, into a hugely interesting history of the Manchester club itself. Appropriately, White dedicates individual chapters to some of the most outstanding talents of Irish football that were hugely influential at Old Trafford. These include, Johnny Carey, who holds the unique distinction of captaining both national teams that represent the Emerald Isle, the genius that was George Best, and the always compelling Roy Keane. This chapter outlines the historical connection between the Irish and the City of Manchester stretching right back to Irish famine. Irish emigrants were so numerous in the City that part of the Ancoats area was known as Little Ireland and and area of the Rochdale road became known as Irish Town. Chapter two deals with the early history of the Manchester club when it was known as Newton Heath. The author details some of the earliest matches against Irish opposition including Belfast Distillery, and Linfield at Windsor Park. We also learn about the first Irish players to play for the club in the 1890's. Thomas O'Shaughnessy and John Peden ("The George Best of his day.") were in the vanguard of the Irish footballers to play for the club down through the decades. Following the first World War Manchester United bounced between the old First and Second Divisions as well as fleetingly flirting with relegation to the Third Division. There were also financial difficulties off the pitch. During this period Irish involvement with, and influence within, the club was minimal. This changed with the arrival of Tommy Breen, Harry Baird, and eventually Johnny Carey. The author also provides some very interesting historical detail about Patrick O'Connell an unusual and sometimes controversial defender from Dublin. John White dedicates this chapter to the great Irish fullback Johnny Carey. Unfortunately for Carey and United his football career was punctuated by World War Two however he still managed to make his mark. In addition to being renowned for his footballing ability he was also acknowledged as a intelligent person with great integrity. When WW II broke out he chose to serve in the British army even though, as a citizen of the Irish Free State, he could have avoided military service. His principled view was that he should be prepared to fight for the country that was providing him with a livelihood. As the title suggests, chapter five deals with the Irish involvement with Manchester United during the Matt Busby era. To many people one of the greatest tragedies to ever befall Irish football was when the immensely talented Liam Whelan was cut down in his footballing infancy in the Munich air disaster. In addition to Whelan a number of other very talented Irishmen came under the influence of the great Busby. These include, amongst others, Jackie Blanchflower, Jackie Scott and the heroic Harry Gregg. In addition to the loss of Ireland's Whelan the Munich air crash also effectively ended the career of the hugely talented Jackie Blanchflower from Belfast. On a happier note Harry Gregg, who heroically rescued survivors from the wreckage of the aircraft, was able to continue with his career. Following on from the tragedy Manchester United was now even more deeply embedded in the affections of many Irish people. Chapter six covers the period when Matt Busby rebuilt United into a competitive force in England and in Europe. Once again Busby recruited Irish talent in the form of Shay Brennan, Johnny Giles, Noel Cantwell, Jimmy Nicholson, Ronnie Briggs, and Sammy McMillan. 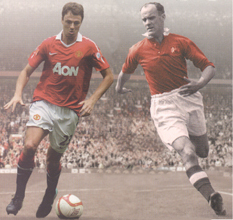 Talented as these Irish players were, none could compare with a skinny teenager that joined Manchester United in 1962. In the history of association football there have been very few players that could compare favourably with the immensely talented George Best. Many United fans mourn the early loss to the club of such an amazing talent but as John White points out, Best notched up a total of 470 appearances for the Reds. This chapter deals with the period following Matt Busby's ultimate achievement, the 1968 European Cup triumph at Wembley. John White covers the period when Frank O'Farrell, the only Irishman to ever manage Manchester United, took up the reins at Old Trafford. O'Farrell signed one Irish player during his short time as manager - Trevor Anderson from Belfast. Notably O'Farrell also gave another talented Belfast prodigy, Sammy McIlroy, his debut for the Reds. This chapter also covers the Tommy Docherty era. When Dave Sexton replaced the sacked Docherty in 1977 he inherited a large Irish contingent. Sammy McIlroy, Jimmy Nicholl, David McCreery, Tommy Jackson, Paddy Roche, Chris McGrath, and Docherty's last signing, Ashley Grimes. During Sexton's reign he gave debuts to three other Irishmen, Tom Sloan from Ballymena, Tom Connell from Newry, and a Dubliner called Kevin Moran. Sexton's tenure was unsuccessful and his replacement, Ron Atkinson, had new ideas and a large transfer budget. The acquisition of Bryan Robson for a British record fee of £1.5m and other new faces meant great servants such as Sammy McIlroy and Jimmy Nicholl were surplus to requirements. Ultimately McIlroy made 419 appearances for United and scored 71 goals. Ironically he scored three of these goals - his only hat-trick for United - in one of his last matches for the club. The four Irishmen that John White refers to in the title are GAA-convert Kevin Moran, the sublimely talented Norman Whiteside from Belfast, the majestic Paul McGrath, and record signing from Arsenal, Frank Stapleton. Ron Atkinson could not claim a League title but he did win two FA Cup finals with United. The second, in 1985, against Everton is memorable for a number reasons and the four Irishmen played notable roles. Firstly, Kevin Moran became the first player to be sent off in an FA Cup final for his poorly-timed challenge on Peter Reid in the 78th minute. The score was 0-0 and striker Stapleton was forced to take Moran's position alongside McGrath in central defence. The match went to extra time and the magnificent McGrath ably assisted by Stapleton repelled all that Everton could throw at them. Just as a penalty shoot-out loomed, up stepped Norman Whiteside to curl a stunning left-foot shot beyond the despairing dive of Everton goalkeeper Neville South. United won 1-0. When Alex Ferguson became the United manager in 1986 everyone expected changes would follow. Almost no-one could have predicted that within a few seasons all of the 'Four Irishmen of the Eighties' would have moved on to other clubs. Any suspicions of an anti-Irish bias by Ferguson were unfounded, as two Irish players stayed on the Old Trafford books, Liam O'Brien and Derek Brazil. Ferguson felt the need to impose his methods and discipline on the the club and the Four Irishmen simply didn't fit. In 1988 Ferguson signed the highly experienced Mal Donaghy. When Belfastman Donaghy left the club in August 1992 after 119 appearance it was the first time since 1951 that there was no Northern Irishman on the Old Trafford books. This changed in January 1993 when Keith Gllespie from Larne signed professional papers. Prior to that, in 1990, Alex Ferguson made one of his best ever signings, Denis Irwin from Cork. As the title of this chapter suggests this section of the book is largely dedicated to the hugely influential, and often controversial, Roy Keane. After the departure of the enigmatic Eric Cantona manager Alex Ferguson chose Keane as his captain. The Cork man was the embodiment of the manager on the pitch. Following Johnny Carey, and fellow Cork man Noel Cantwell, Roy Keane became the third Irishman to captain Manchester United. This chapter also provides extensive detail on the ever-reliable and underrated Denis Irwin, in addition to the unusual tale of the Northern Ireland international who gave up his football career to become a Catholic priest. At the time of publication of Irish Devils there were only two Irish players that had made a start for the United first team - Jonny Evans and Darron Gibson (Michael Keane had made one substitute appearance in the League Cup on 25 October 2011). Author John White uses the last chapter of the Irish Devils run the rule over Evans and Gibson and other Irish players that have played for United with varying degrees of success including Waterford's John O'Shea, County Down's David Healy MBE, goalkeeper Roy Carroll from Enniskillen, and Cork's Liam Miller. 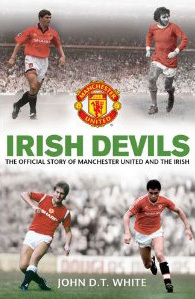 Irish Devils is a fantastic read and a brilliant reference source for all fans of Manchester United and of Irish football. John White's appendix at the back of the book is packed with detailed statistical information about every single Irishman that has ever played for Manchester United. Even if you are not a fan of United and / or if you are not Irish, White's latest book is a masterpiece that plots the development of a sporting and social phenomenon that has resonance far beyond Manchester United and the club's fans. I totally recommend Irish Devils by John White. It would make a perfect stocking-filler at Christmas or an ideal gift at any time. John D.T. White is the author of numerous books, but the Red Devils have always been his first love, and this is his seventh book about his beloved United. He is the founding member of Carryduff Manchester United Supporters' Club, the largest official supporters club in Ireland. He has been a season ticket holder at Old Trafford for the pat 20 years. He lives in Carryduff, County Down, with his wife Janice and two sons, Marc and Paul.